Kwakwaka’wakw art has a long history of tradition and innovation, of legacy and inventiveness. Since the beginning, it’s been an evolving exploration of expression, design and form. The Kwakwaka’wakw (pronounced Kwak-wak-ya-wak), or Kwagiulth, are the original inhabitants of northern Vancouver Island, the adjacent mainland and the islands in between. Kwakwaka’wakw literally translates as “Those who speak Kwak’wala”, describing the collective nations within the area that speak the language. Until the 1980s, the term Kwakiutl was used to describe all First Nations peoples in the area, regardless of the language they spoke. Today, the name Kwakiutl only refers to those from the village of Fort Rupert. Other Kwakwaka’wakw also have their own names and villages, as each of the 13 nations are considered separate, independent entities. Kwakwaka’wakw art is perhaps one of the most distinctive forms of northwest coast art. 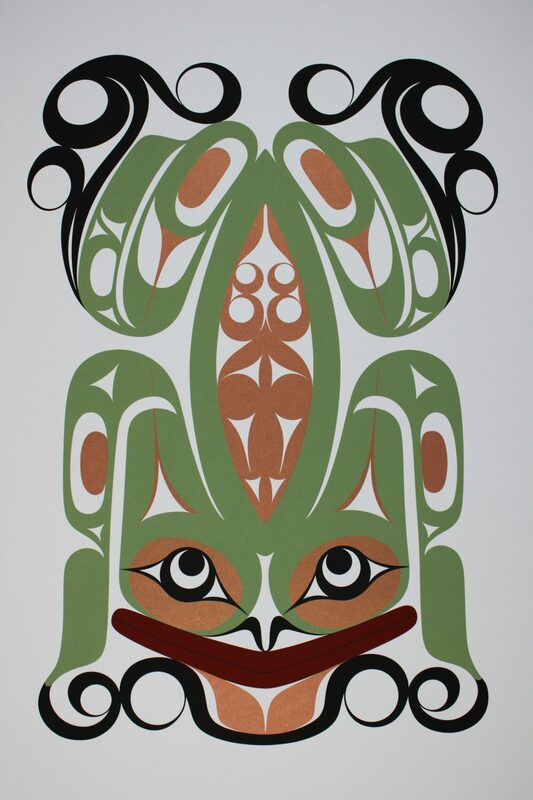 Kwakwaka’wakw artists have always been among the most innovative artists on the coast, using an individualized approach to expression and form and colours that go beyond the traditional. Haida artist Bill Reid was quoted as saying that the Kwakiutl were explosive. If there was a colour, they used it. The resurgence of Kwakwaka’wakw northwest coast art in the 1950s is largely credited to Mungo Martin, one of the most distinguished Kwakwaka’wakw carvers. In 1951, he was hired by the Royal BC Museum for a program of restoration and replication—a program that played a major role in the survival and transmission of northwest coast art traditions. Martin brought traditional Kwakwaka’wakw culture and knowledge out of the banned potlatch era and into the open, inspiring a whole new generation of northwest coast artists.